Sometimes it takes so long to get your hands on a coveted object that you can end up with something that only vaguely resembles the treasured thing you originally set your heart on. That is what happened to me recently, when I finally got my hands on a Hiwi ceramic figurine (below) after 10 years of fruitless searching. The Hiwi are an indigenous people who live along the Orinoco River and its tributaries near Puerto Ayacucho, where one bank of the mighty river is in Venezuela and the other in Colombia. They also inhabit the savannahs along Colombia's Meta and Vichada rivers and some groups are found in Venezuela's Apure, Guarico and Bolivar states. There are nearly 15,000 Hiwi in Venezuela and more than twice that in Colombia. In Spanish their tribal name is rendered as Jivi, or Guajibo (sometimes spelled Guahibo) and they speak a language which was once thought to be Arawakan but is now classed as Independent. The Hiwi are noted for their skill at making necklaces and decorated baskets and they produce sought-after hammocks from moriche palm (known as "chinchorro" in Venezuela). But I've always been fascinated by the ceramics, especially the effigy vessels of male and female Hiwi covered in symbolically-important markings. Few contemporary Venezuelan tribal groups produce elaborate ceramics, so when I chanced upon a slim booklet about Hiwi pottery traditions by a ceramicist called Alfredo Almeida I was intrigued. Almeida's book was on sale at the past-its-glory-and-a-bit-dusty-but-still-fascinating Monsenor Enzo Ceccarrelli Ethnological Museum in Puerto Ayucucho, the capital of Amazonas State. As I studied a display of Hiwi ceramics from the museum's collection I was able to compare the originals with Almeida's illustrations of male effigy vessels, which he called "Jivitonuu" and female effigy vessels which he called "Jivitovaa". It was clear the female figurines in the museum all had the geometrical markings of squares within squares, which Almeida said corresponded to "Ikuli Itanee", the tortoise, used specifically as a design in face painting by Hiwi women. Almeida had done his research into Hiwi pottery in the 1970s in a tribal community called la Reforma. Along the way he had met Guillermo Guevara Kukubi who explained that "the history of Hiwi pottery goes back to the very origin and appearance of the first guajibo on Planet Earth. "As the Jivi have taught us we come from inside the Earth, from a place called Unianato, a place located 5 kilometres west of the Atures rapids on the left side of the Orinoco, today Colombian territory," explained Guevara. "Each Jivi man who came out of the Earth carried with him an earthenware jar to drink water from. But more than an earthenware jar for practical use, it was also a model for the creation of the varied forms of Jivi pottery that we have today," he wrote. Guevara says the figures and designs were introduced by Kuvai, or Kuwai, the Hiwi culture hero, who first created the Shaman's prayers and the symbolic designs emerged from them and were passed on to the Hiwi so they could remember the stories of creation and the sacred prayers. Pressed for time I missed the chance to buy myself some figurines from the Hiwi vendors in the market outside the museum but vowed I would return. Twenty years later, when I finally got the chance to visit the market again after a tremendous river trip to Cerro Autana, the figurines on sale had changed almost completely. No longer did they have a slight glaze to the pottery or dark designs painted on the surface. Time had moved on and the Hiwi figurines seemed to have lost touch with their mythical past. They looked slick and slightly generic, objects made to sell to tourists rather than meaningful expressions of Hiwi culture. I bought one of the figurines anyway, at least to have something to take home. But the question remains. 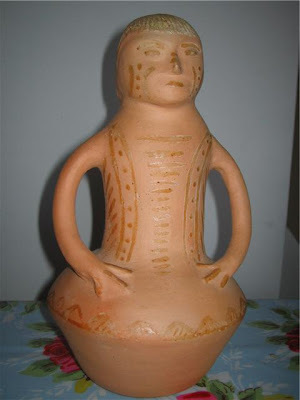 Are there communities of Hiwi in Venezuela or Colombia still making traditional figurines? My search is not over yet.